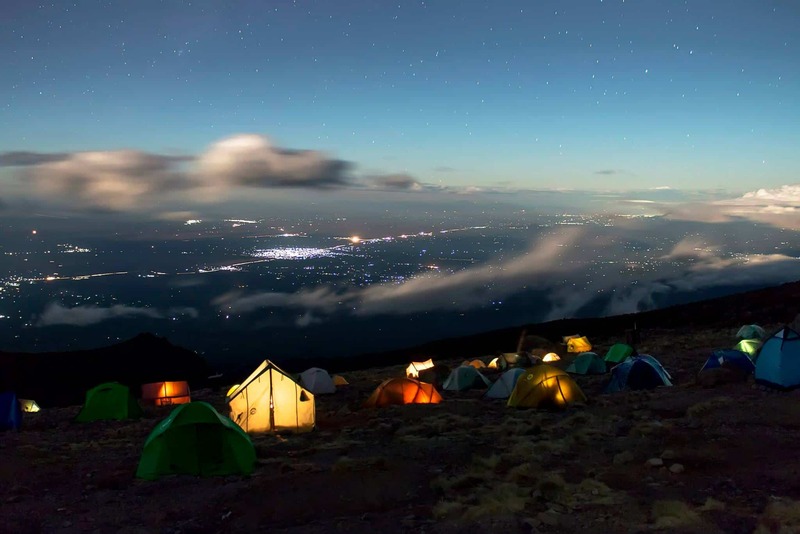 The 9 days Lemosho Route is one of the lengthiest, most picturesque routes on Kilimanjaro and it is our ‘secret favourite’. You will traverse through tranquil trails that feature scenic grandeur. In the rainforest the exquisiteness of dawn’s light pierces the lush, emerald sward. Mist embraces the lichen coated bark and the melodic piping of a songbird splits the silence whilst the distinctive blue monkeys swing above. This leads to the smooth surfaces of the stunning Shira Plateau and the magnificent sight of the looming Lava Tower. Barranco Valley provides beautiful sights of the azure glaciers. Vast plains of Savannah are decorated with splotches of wildlife and there is a possibility of encountering elephants or buffalo. The Mweka Route is used to descend and you have a good chance of completing the 9 days Lemosho Route due to the advantageous acclimatisation conditions. Kilimanjaro captivates the hearts of those who reach the summit but this route exceedingly epitomises Africa’s magnificence. After enjoying an appetising meal at the hotel, you will embark on a bumpy three-hour drive from Moshi to the Londorossi Gate. We will travel amid the fascinating town of Boma N’gombe and the native people of Sanya Juu. Registration will be completed at the gate and then we will drive to the starting point of your trek at 2,350m. The trail journeys through the thick, untamed rainforest for the duration of the day. Adorable Bush Babies and curious Black and White Colobus Monkeys may peer down from the high trees. Mti Mkubwa Camp is our final destination for the day and the hike is fairly short. 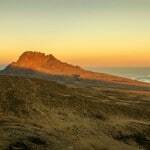 The trail heads towards Shira Camp 1 and there is shift in scenery to the heather and moorland zone – an arid landscape sprinkled with contrasting silver fauna and flora as well as the enormous lobelias. Stunning views of Mount Meru engulfing the fiery sunset are present in the west and the gleaming Kibo Peak makes its presence known. The light clouds will begin to float around you as you cross several calming streams to get to the Shira Ridge (3,600m). We will proceed to Shira Camp 1 where a delicious meal awaits. The moorland landscape remains with its dusty, rocky ground and low grasses and shrubs. The bright everlastings erupt from the ground and the concentric rings of leaves on the celestial lobelias are astonishing. The scenic views of the towering mountain are best observed from this area and the path is generally flat. A steaming hot lunch will be served at Shira Camp and after the short excursions for acclimatisation are complete, you will rest for the remainder of the day. In the evening the stars twinkle from the infinite arch of darkness. In areas they are sapphire balls and beautiful, shimmering in their heavenly finery. The ones on the outermost boundary, virtually outside the span of human comprehension, are like glinting pinpricks in a shroud of blackness. 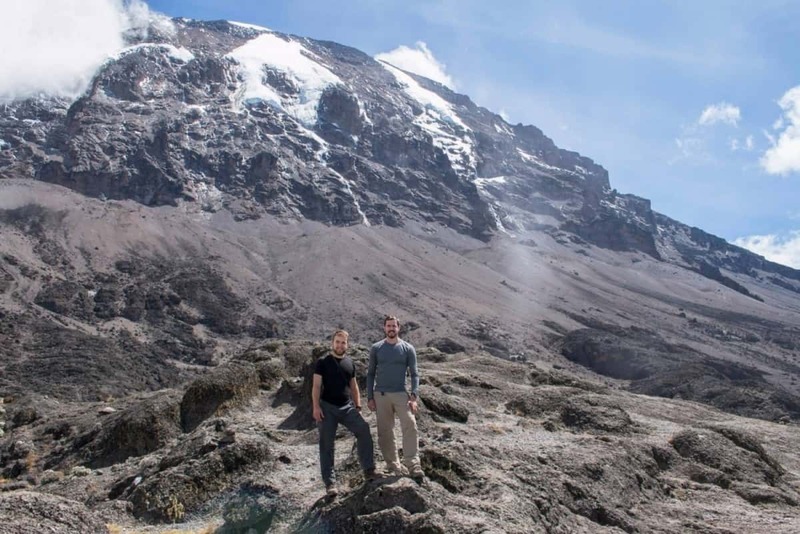 Today the Lemosho route connects with the Machame route before approaching Lava Tower. The landscapes are magnificent and the trail begins with a gentle incline towards the beautiful sights Kibo Peak. The first milestone is a jagged ridge named the Shark’s Tooth (4,400m) and after crossing the mysterious shadow valleys we will come across the protruding Lava Tower (4,600m). Thousands of years ago enormous volcanos erupted and spluttered the remains of the once molten rocks. 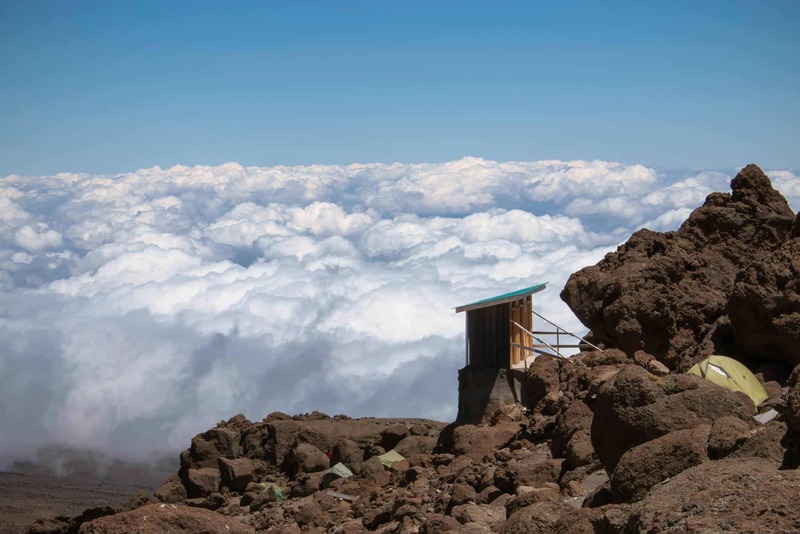 The gradual descent to the Barranco Camp features incredible views of the bleached Western Breach and the striking Barranco or ‘Breakfast’ Wall. This day follows the mountaineering principles of walking high and sleeping low, making it an ideal acclimation day. 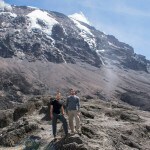 The day begins with a moderate trek up the Barranco Wall, it is steep but the climbing only requires your hands and feet for a short period of time (200m). 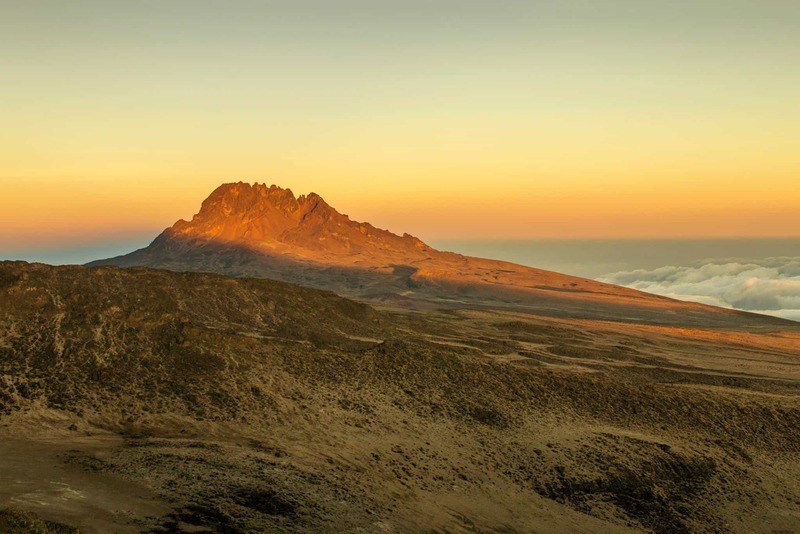 Feelings of satisfaction will begin to emerge once you witness the beautiful landscape that includes the smoothed edges of Kibo peak and a vantage point of the frosted scenery. The trail begins to fluctuate as we cross various small streams and the Karanga River that excitedly hops over the rocks. 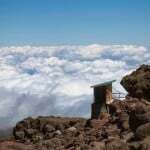 We will stop at the Karanga Campsite for an appetising lunch (3,930m). 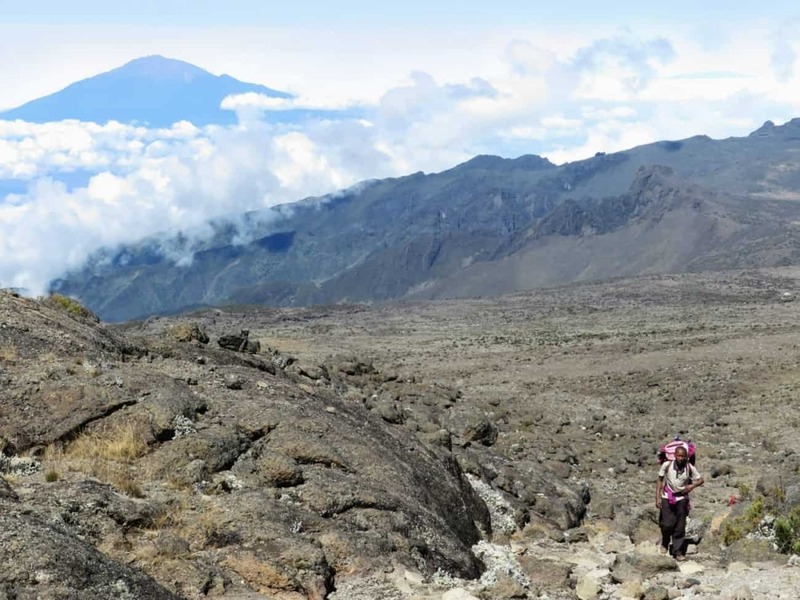 An hour’s climb up a steep, granite lava ridge will lead us to the Barafu Camp. This signifies that you have conquered the South Circuit of the mountain and the views of the summit will shift. The infertile grounds at the Barafu Campsite tend to freeze over and the temperatures shift dramatically. A warm, hearty meal will be prepared and we suggest that you rest early as the midnight climb to the summit (1188m) is only a few hours away. You will be awoken at 11:00pm to ensure that you have a light snack and a hot beverage before you embark on your 5km trek to the summit. Sixteen hours are needed to complete the trek, it goes without saying, this is the most taxing day on the 9 days Lemosho Route. The temperatures will dip to lows of up to -10°C. The trail along the stunning valley on the edge of scree fields will gradually increase. Stella’s Point (5,672m) is the first milestone and you will pass the glowing Rebmann and Ratzel glaciers. Illuminating rays of orange, red and purple begin to burst from the sky as you reach the southern rim of Kibo (Marks an hour until the summit). 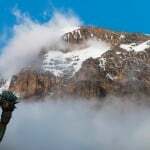 Upon reaching Uhuru Peak (5,895m) you will attain an intangible reward, the heaven touching apex of the mountain drenched in a shroud of clouds and splotches of gleaming snow impale the lush floor. Across the horizon you will see the glaciers protruding like a row of thorns. 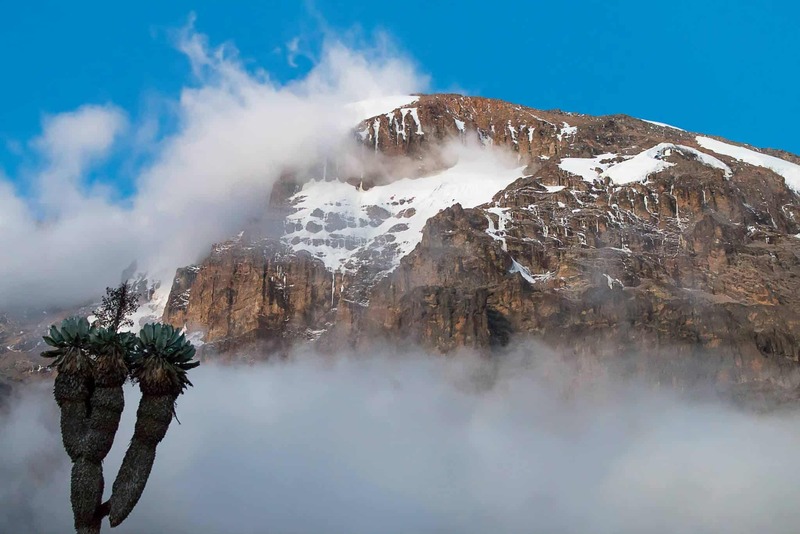 Swaddled around them are necklaces of powdery snow, frosty ice fields and Mawenzi Peak. We will begin descending towards the Barafu Camp where we will have a short break before proceeding to the Mweka Camp (3,100m). 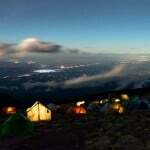 The 9km trails features stunning views of the magnificent Kilimanjaro plains. The incline traverses down a rocky scree path through barren moorland and then you will enter the magnificent forest (4-5 hour hike). A tantalising meal will be served at the campsite and you will be able to snuggle in your sleeping bag. You will enjoy an appetising breakfast before you descent to the Mweka Gate (1,300m). The leisurely stroll provides you with beautiful sceneries. A Gold Summit Certificate will be awarded upon reaching the gate, a token to symbolize successfully tackling the 9 days Lemosho Route. From the tranquil Mweka Village you will be driven back to your hotel. Today our driver will transport you to the airport from where you will link your flight back home. If you’ve chosen to continue on a safari – well, that’s a another adventure and we’ll manage that for you as well!